Learn how to make paella at home with Easy Shortcut Shrimp Paella that’s ready in 30 minutes total. Garlic, onion, bell pepper and diced tomato with Spanish rice and sauteed shrimp. Depending on who you ask, you may get a wide range of answers as to what paella is. There’s a few basics that should be included, but beyond that it’s often up to the chef as to the specifics. 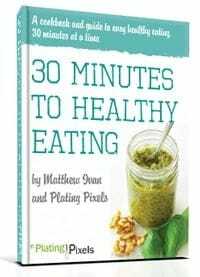 One thing that is generally true is it can be a time consuming recipe. This Easy Shortcut Shrimp Paella gives you that classic flavor, but saves lots of time and steps. All paellas start with a sofrito－a flavor base of vegetables cooked in oil. Typically this includes garlic, tomatoes and onion. The medley of flavors then infuse into the rice. Another classic element is the socarrat, which is a flavorful crust on the bottom of the pan. These elements all blend together with cooked rice to create the typical paella flavor. Learn more about paellas from Saveur. 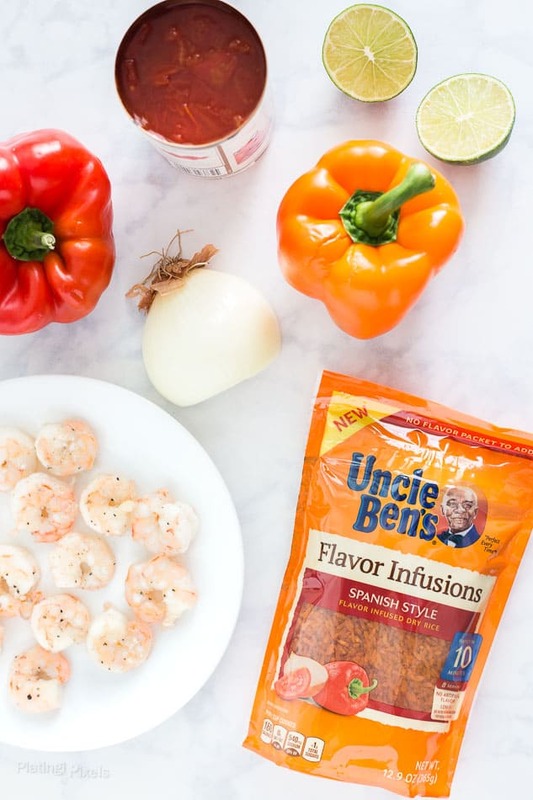 To save time and take a shortcut with this paella, I use Uncle Ben’s® Flavor Infusions Spanish Style rice. It’s cooks in about 10 minutes, with five different flavors to choose from. Natural flavors are steamed into each grain, so no flavor pouches are needed. Even better, there’s no artificial preservatives or flavors. Each resealable pouch provides a plentiful 8 servings. This rice creates most of the flavor base, along with freshly sauteed garlic, onion and bell pepper. Growing up, my mom would always use canned diced tomatoes to substitute some water in Spanish rice. 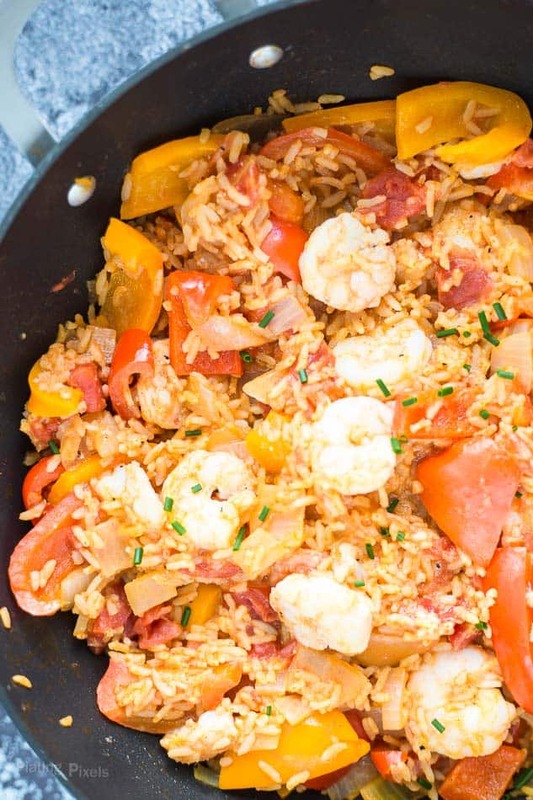 This trick works wonderfully to create this easy shortcut shrimp paella along with Flavor Infusions Spanish Style rice. 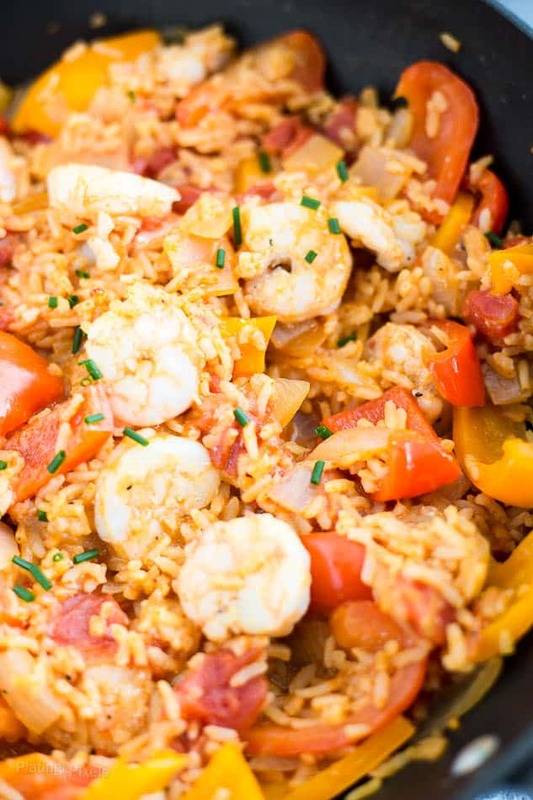 Typically paella includes various seafood, and shrimp is one of the easiest and quickest to cook. Sauteing the shrimp first, instead of cooking with the rice, quickly creates the socarrat－crispy flavor bits that mix into the paella. Plus it adds lean protein to this easy family dinner. With few ingredients and some simple tricks, you’ll have Easy Shortcut Shrimp Paella in no time. Flavor profiles: Rich, savory and bold Spanish flavors. Texture: Tender shrimp and veggies with fluffy rice. 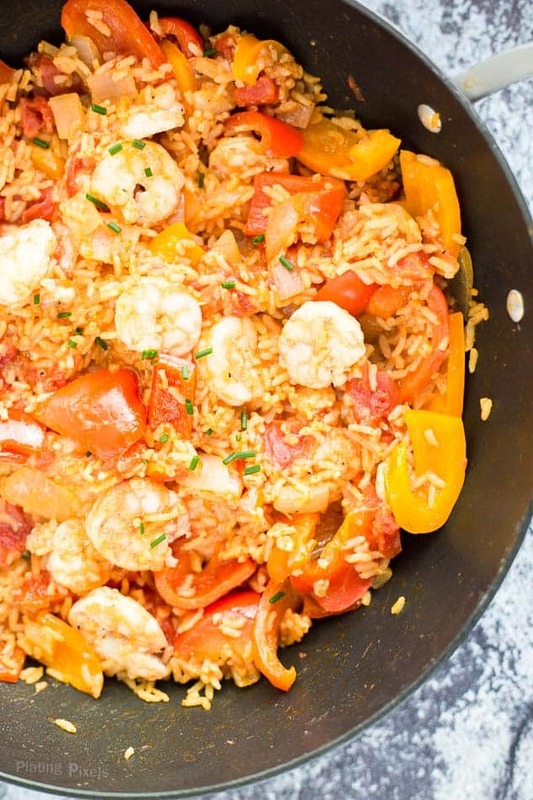 Homemade Easy Shortcut Shrimp Paella that's ready in 30 minutes total. Garlic, onion, bell pepper and diced tomato with Spanish rice and sauteed shrimp. Heat 1-tablespoon olive oil in a large non-stick pan to medium-high heat. Add shrimp and sprinkle with salt and pepper. Cook 2-3 minutes on each side, until opaque. Remove from pan, reserving any excess liquid, set aside. Heat remaining olive oil in same pan. Add garlic, onion and bell pepper. Saute 5-7 minutes, until slightly tender. Stir in rice, canned diced tomato and water. Bring to a boil then reduce heat. Simmer 15 minutes covered, until rice is cooked and liquid has soaked up. Stir in cooked shrimp and garnish with fresh squeezed lime juice and chives before serving. Looks super easy and delicious! I love when shortcuts like these not only save time but add extra flavor or a unique twist too. What a great trick on making a more complicated dish! Super inventive, I love these little shortcuts on crazy days. I love the quick twist on paella. This is dish that my family loves but I don’t often take the time to make it. Now I can! Paella is a family favorite out at restaurants – love that you’ve made this doable for weeknight meals, too! I’ve never made paella before because I knew it could be time-consuming. This is a great idea for a shortcut. I’ll have to make it now!